Transferring your files from your computer to the remote server - FTP. The process of transferring your website files (pages, images, videos etc) from your computer to the server is called FTP (File Transfer Protocol). A number of programmes are available to do this - or you can use your browser, though this doesn't offer as many facilities. Try Googling 'ftp software'. After logging in to your control panel you will see a screen similar to that shown below. 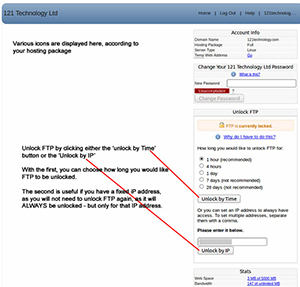 An extra security feature - not offered by many hosting providers - means that FTP is locked by default. In order to transfer your files, you will need to 'unlock ftp' first. With most broadband providers you get a 'dynamic' IP address; this number can change every time you restart your computer or broadband. If you have a 'static' IP address, tick the 'unlock by IP' button (your IP address is detected automatically), then you won't need to log in each time you want to ftp files to your site.